As part of the Dragon on the Lake festivities, the Lake Orion Lake Association is again sponsoring the Lighted Boat Parade on Lake Orion. We will be starting at dark on Friday the 24th of August with the viewing area at Pelton’s Point. Decorate your boat and join the annual Lighted Boat Parade! 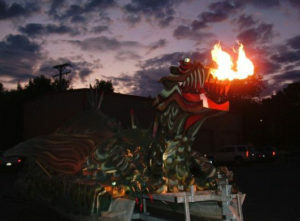 Follow the Fire Breathing Dragon around Lake Orion as we kick off Dragon on the Lake! The Lake is ablaze with color as dozens of boats covered with lights join the parade which starts in the Orion Marine, Pelton Point area at dusk and travels around the shoreline. Public viewing at Pelton’s Point in Lake Orion. Win the prestigious ‘LOLA Dragon Cup’ and cash prizes! Boats will be judged on best decorations, with the winner inscribed on the Dragon Cup. The winner will be announced Sunday afternoon following the Dragon Boat races at the Dragon on the Lake – Main Entertainment Stage. You must register to receive your boat number for judging. The registration will take place between 7pm – 8pm and will be located just south of the Boat Club Island. Look for the double decker boat with the LOLA banners for registration. Get your team together and contact us through our Facebook page or email at lola@lolainfo.org. Cash prizes are awarded for the best boats.